A PRIVATE VIEW OF BUFFALO BILL. 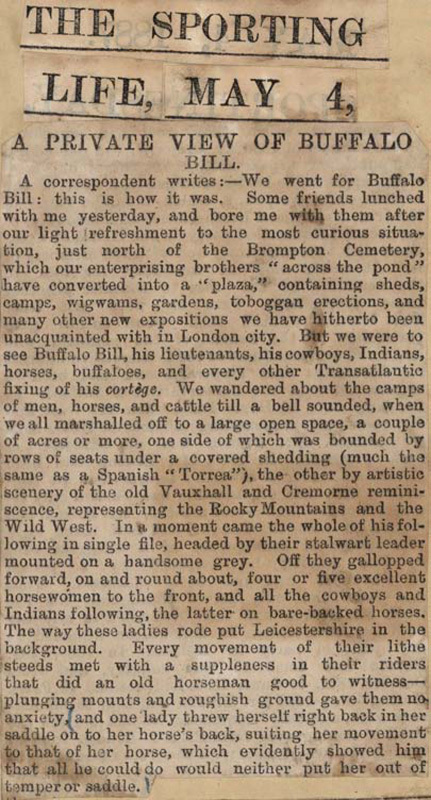 A correspondent writes:—We went for Buffalo Bill: this is how it was. Some friends lunched with me yesterday, and bore me with them after our light refreshment to the most curious situation, just north of the Brompton Cemetery, which our enterprising brothers "across the pond" have converted into a "plaza," containing sheds, camps, wigwams, gardens, toboggan erections, and many other new expositions we have hitherto been unacquainted with in London city. But we were to see Buffalo Bill, his lieutenants, his cowboys, Indians, horses, buffaloes, and every other Transatlantic fixing of his cortége. We wandered about the camps of men, horses, and cattle till a bell sounded, when we all marshalled off to a large open space, a couple of acres or more, one side of which was bounded by rows of seats under a covered shedding (much the same as a Spanish "Torrea"), the other by artistic scenery of the old Vauxhall and Cremorne reminiscence, representing the Rocky Mountains and the Wild West. In a moment came the whole of his following in single file, headed by their stalwart leader mounted on a handsome grey. Off they gallopped forward, on and round about, four or five excellent horsewomen to the front, and all the cowboys and Indians following, the latter on bare-backed horses. The way these ladies rode put Leicestershire in the background. Every movement of their lithe steeds met with a suppleness in their riders that did an old horseman good to witness—plunging mounts and roughish ground gave them no anxiety, and one lady threw herself right back in her saddle on to her horse's back, suiting her movement to that of her horse, which evidently showed him that all he could do would neither put her out of temper or saddle.